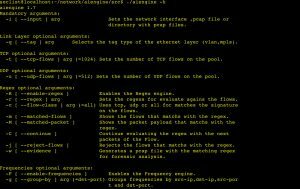 Browse: Home / AIEngine v1.8.0 – Artificial Inteligent Engine. + Support for extract TXT records from DNS, fix minor issue in OpenFlow and clean code. – Support for Point to Point over Ethernet protocol. – Support for multiple schedulers (multiple Timers). – Support for Radix trees on IP lookups (https://github.com/ytakano/radix_tree). – Support for SMB(Server Message Block) protocol. – Provide assign IP address on the DHCP. – Minor issues and fixes on the SSL. – Minor Fixes and performance improvements on HTTP/SIP/POP/IMAP and SMTP. ← ISF – Industrial Security Framework.